There seem to have been three big food fads lately, which I haven't been able to understand: cupcakes, cronuts and frozen yoghurt (froyo). They all happen to be sweet, and they are everywhere, and my question is this: why dedicate your entire shop to cupcakes, say, when you could be selling all manner of delicious things? What would you rather see offered in your local dessert shop? * Some claim Giapo makes the best ice cream in the world. I may get around to blogging about this central Auckland mecca soon, but it's been covered by so many others already, including a couple who shared the little shop's newest invention, the plated cone. Yoghurt Story store on Queen St, Auckland. Apart from the retail stores in the table above, which sell frozen yoghurt as their primary or only product, many ice cream stores such as New Zealand Natural also offer froyo, as do eateries including the Food Truck Garage. A quick search on the internet reveals that there is a supplier called Monalisa in Parnell which sells froyo machines, powders and accessories such as custom cups, and the Majors Group can also help you everything you need to get started, from the topping counter to yoghurt mixes from Italy. For those who want to eat frozen yoghurt at home, there is now a variety of brands and flavours to choose from at the supermarket, from Fonterra Brand's Tip Top tubs to Cone King's products. Novelty: new generation froyo stores look delightful, modern and fun, quite different from traditional ice cream parlours. It's tempting to try a new place at least once. 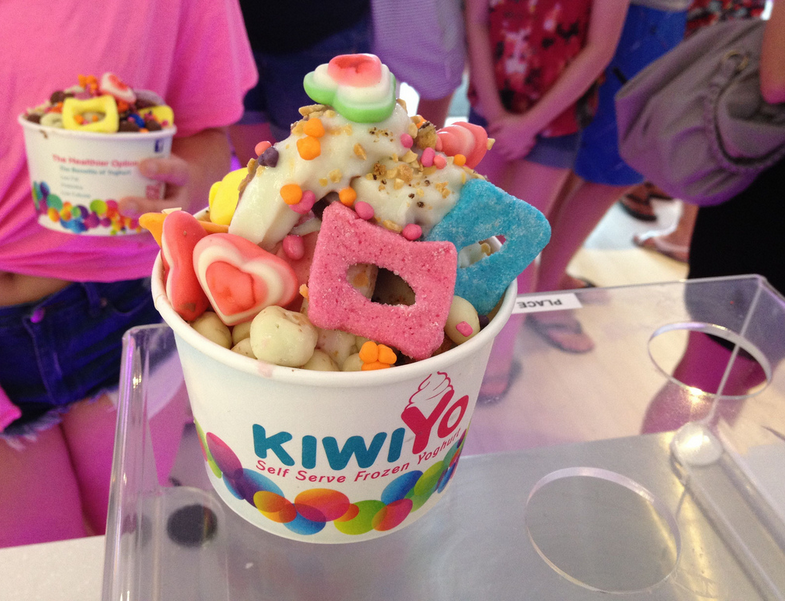 Self-service: you can pick and choose the toppings that you want, in addition to the flavour of the froyo base. No need to engage with someone to craft an ice cream; you get to decide exactly how you want it. Colour and choice: often the toppings are beautifully displayed, with attractive colours and a variety of textures. The possible combinations are endless. Payment by weight: no such thing as small, medium or large here; you decide how much you want. The attendants will always encourage you to pick up a larger cup though, to "ensure your toppings don't fall off", but although you could have a small serving in a large cup, that is less likely to be the actual outcome. Health claims: froyo is supposed to be lower in fat than traditional ice cream, and contain probiotics, which are health-promoting micro-organisms. Social media: many of the stores have a camera available for you to easily share your froyo creations with your friends, and entice them to eat the dessert too! At least one blogger has commented on the enthusiastic community that KiwiYo has created, for instance. For retailers, selling frozen yoghurt is attractive because of its profit margins (apparently in a typical serving, there is a markup of 500%, though it becomes less once you take expenses like rent into account), and low labour costs (as the stores are self-service). Frozen yoghurt creation from the KiwiYo Flickr page. In fact, frozen yoghurt is becoming popular around the world. According to market research firm Mintel, the US saw a whopping 74% sales increase for frozen yoghurt in the 2011-2013 period, compared to only a 3.9% increase in the sales for ice cream. In the UK, froyo sales increased by 50% in the 2010-2012 period. So What's In It? Is it Good For You? Some of the health benefits suggested for frozen yoghurt sound so ludicrous that it might be enough to put you off eating it. Yoghurt Story not only says it is low in fat and high in protein and calcium, but that it "lowers the risk of subsequent heart disease and diabetes", while KiwiYo claims the probiotics in the yoghurt will aid in "overcoming skin problems", act "nutritionally as anti-carcinogenic and anti-tumor agents" and "combat[...] yeast overgrowth and fungal infections"! So what is froyo made of, and is it really good for you? I went to a couple of shops in the inner city, and asked them for more information. Yoghurt Story could not provide a list of ingredients, but did have nutritional info for each flavour. I could see that most had a sugar content of 18-20%, and the staff member was quick to assure me the sugar content came from "completely natural" sources. The Yogoberry Waffle Cafe explained they did not have an ingredients list, because the product was brought in as a pre-packaged mix. KiwiYo, surprisingly, had full disclosure, with the screens above the dispensers cycling between the (very long#) ingredients list, the nutritional information, and advertising (e.g. "gluten free") for each flavour. However, I was told that taking pictures of the screens or the topping counter was forbidden, and none of this information was available on their website. 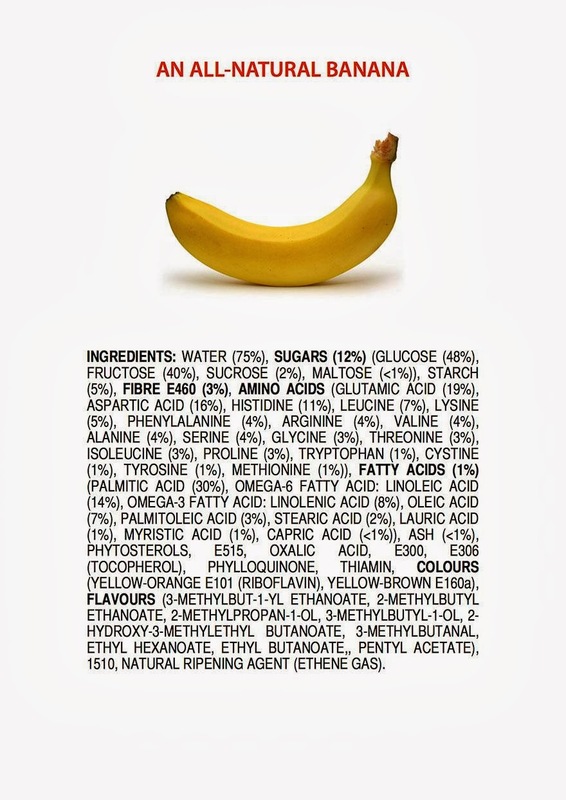 # To make fun of the fear of long ingredient lists filled with "unknown chemicals", Australian chemistry teacher James Kennedy made a series of ingredient infographics for such natural items as bananas, eggs and blueberries. I also went to the Food Truck Garage, which I was particularly interested in, because it is a high-profile eatery associated with healthy fast food. The staff were again unable to provide a list of ingredients, but owner James (not the chemistry teacher) later emailed me the details below. It's worth noting that the froyo at this eatery is quite different from the parlours down the road in that they help control your portion size (it's not self-service), only serve the plain flavour, and also give you minimal toppings. The product is 100% Natural with no artificial nasties in the mix. Sugar, Instant Whole Milk Powder, Maltodextrin, Instant Skim Milk Powder, Inulin, Dextrose, Fresh Cultured Yogurt, Gum Arabic, Citric Acid, Xanthan Gum, Carrageenan, Guar Gum. Fat, even saturated fat, isn't necessarily bad for you. Thickeners and binders like carageenan and guar gum are needed to give a low-fat product a full-fat texture, making it more processed than traditional ice cream (though these ingredients are also used in, say, Tip Top Vanilla Ice Cream). The nutritional info above is for one particular variety of froyo. There are likely to be more nasty-sounding ingredients in other varieties, particularly ones with flavourings and colourings. The more toppings you add, the more sugary and unhealthy your froyo is going to be. The numbers above do not take this into account. Not all frozen yoghurt will contain live probiotic bacteria, especially if it has been heat-treated. In general, frozen yoghurt will have less bacteria than the original yoghurt it was made from. I guess the main thing to remember is to treat froyo as the dessert that it is, rather than as a health food. Although the number of frozen yoghurt stores popping up, at least in Auckland, has been quite incredible, I have also been noticing other frozen desserts places appearing. 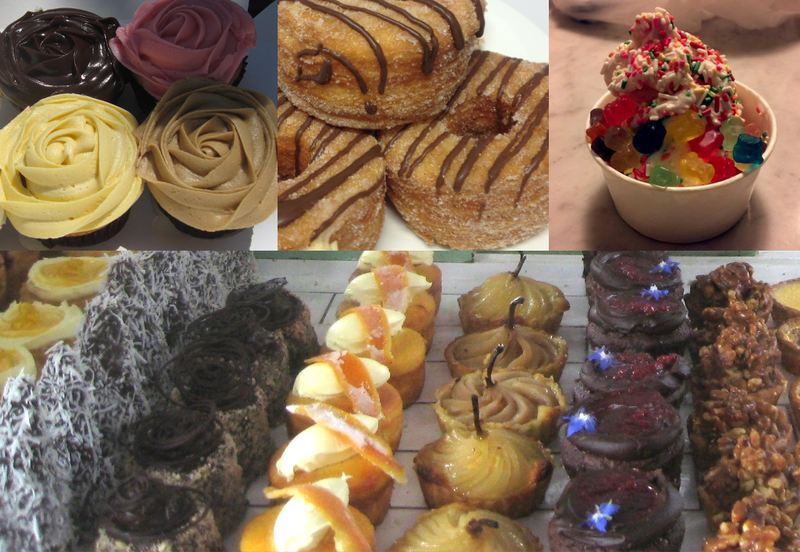 Dessert Dojo had their grand opening in Ponsonby a month ago, specialising in ice creams with toppings mixed in by hand. Not only do they have a very attractive store interior, they also have a photo booth, which you can use for free if you have purchased enough ice cream. 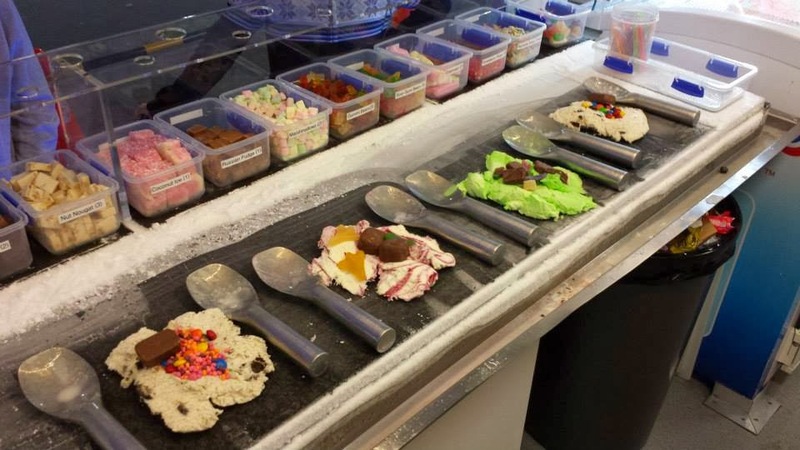 Crazy Mixed Up Ice Cream in Pakuranga, which opened in May 2013, has a similar concept. Somehow, I don't think their shows are quite as spectacular as that of some employees at Cold Stone Creamery in America though. Picture from Crazy Mixed Up Ice Cream. Despite the number of Italian gelato vendors that have been around for years (apart from the aforementioned Giapo, I can think of several established businesses in central Auckland, including Valentino's Gelato, Ginelli's^, Gelatiamo, iStorm Gelato and Casa del Gelato), that is not stopping newcomers such as Zuzu's Gelato from opening as well. ^ Ginelli's used to have a retail store in Mission Bay, which is now the site of a froyo outlet. Although they no longer have a shop, you can still buy their ice cream at Pizza Planet in the IMAX foodcourt, as well as from certain upmarket supermarkets and restaurants. Then there is Pride and Joy, which sells ice cream which is local and produced in small batches, from steel carts called "pods", which are owned and operated by "remarkable unemployees". Much as I like ice cream and frozen yoghurt, I don't understand how we can suddenly support so many new shops. Is it like roads and cars, where supply induces demand? And if we are happy to fill ourselves with colourful sugary creations, why aren't there more shops selling other forms of desserts, such as hot ones? Wouldn't there be so much more variety in offering hot apple pie, feijoa crumble, baked alaska and so on as well? Argh - I think my first comment got eaten (sorry if I'm doubling up). Love this post - very interesting. I wonder if the reason the places focus on froyo is that simple works well with the self-made thing? Adding other desserts might wreck the pricing model or something. I love these places - indulged too much while in San Francisco last year - but think so far Wellington is lacking in this department. Actually, I just saw a deal on Groupon for froyo in Wellington, at a shop called I Adore on Ghuznee St. It sells milk tea and Asian sweets and things like that as well, so I haven't listed it in the table above. Agree that the pricing model for froyo works in favour of the business. Things like hot desserts wouldn't last as long and you would have to sell it for more money, and you would be less likely to get the teenagers in. I don't know anyone who goes to a parlour and gets a plain serving of frozen yogurt. Most people get all the toppings that they crave. Therefore, if it's a once in a blue moon treat, you are better off getting quality. If you regularly buy tubs to snack on, then go for the healthier option if you like the flavour also. Personally, I prefer gelato. Haha, true. I unintentionally got a plain serving of frozen yoghurt at White's & Co the other day though, because I didn't realise that you could only get toppings if you purchased a cup! I prefer cones to cups in general, but the shop was right in that it would have been difficult to add toppings to it without lots of spillage and wastage. I wish there were more places where you could sit down for hot desserts, but really, I think I prefer variety more than any particular type of dessert. Awesome post! It's funny how froyo is supposedly the healthy one but then there's the option of mounting it with all the random sweet stuff haha. You can put just fruits but then where's the fun in that? haha. I personally thought NZ was a little behind on the froyo bandwagon but I guess we're making up for it now. Also, I think you just gave me a list of more ice cream/gelato places to go to. Thanks, Nelli, glad to be of help! To be honest, I didn't even realise you could add fruit - all I saw was candy and nuts to begin with!